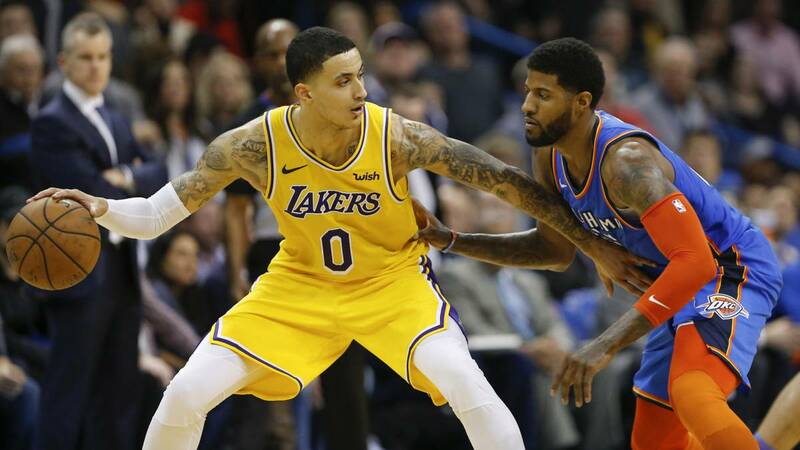 Tremendous victory of the young Lakers before a Thunder that seem to deflate and forced the extension with a controversial play. As if it were a plot to know that they were not going to have LeBron before what was coming on them (visits to Oklahoma and Houston) young players of the Lakers put the batteries to achieve one of their best wins of the year . At home of the Thunder, after being shipwrecked in the first quarter and imposing clearly in the extension. As I said, the first quarter was an abuse of the premises (39-27) with Paul George campaigning at ease. The forward, who finished with 27 points, 7 rebounds, 8 assists and 3 steals seemed to lay the foundations of a simple victory for his people. But this time the little-experienced Angeleno players behaved like the opposite. They dropped their asses in defense, they started to move the ball in attack, they looked into the eyes of the Thunder and they started playing as if nothing had happened. Brandon Ingram, who was horrible in the shot (1/9) gave a clinic delivering game (11 assists), Lonzo made a very complete game (18 + 6 + 10), and Ivica Zubac, who left as a substitute, was again a force of nature in the area (26 + 12, +35 with him in court) . And also facing one of the best pivots of the season as Steven Adams (17 + 15 and 4 steals). But the great protagonist was Kyle Kuzma. It's no surprise that it's the Lakers' main weapon in attack since LeBron's absence. It is true that you usually play a lot of pitches and that not every day is right. But when it is, it is a joy. Last night acabó with 32 points, with a 11/20 in field shots and a spectacular 7/12 in triples. The last play of regulation time was very controversial. The Lakers won by three and Luke Walton asked not to be shot. Lonzo touched Westbrook and he threw from the perimeter later. It did not look like the same action, but the referees gave three free throws to the base that, on the other hand, had an ominous day ahead of the basket. He scored 26 points with 23.3% accuracy in 30 attempts. The first player to get less than 25% with 30 or more shots from Allen Iverson in 2003. Of course, the three free throws to force the extension did not fail them. But once there there was no story. The visitors were very superior and ended up winning easily in overtime (6-16) . The Lakers recover playoff place (they are eighth, tied with the Clippers, seventh, and the Jazz, ninth). He has one game fifth in the Rockets, his next rival on the road. Meanwhile, the Thunder take off definitively from the first two positions and already have the Blazers tied.